"The Giving Tree" collage and my "artist's statement"
Lowered the Butrans dosage tonight from the 10 mcg/hour patch to the 7.5 mcg/hour patch. The Pain Doc predicted no withdrawal symptoms, but I'll be on guard, just in case. He didn't expect me to experience any when I first went on the 10 mcg patch, either, and my symptoms then were surprisingly (and distressingly) dramatic. Kimberly Appelcline is a formerly avid reader and writer who worked as a professional in the book publishing field before health concerns thwarted her in these pursuits. To express the importance of words in her life, and their current inaccessibility, she frequently uses printed text in her artwork as a purely visual element, divorcing it from its purpose as a vehicle of linguistic communication. 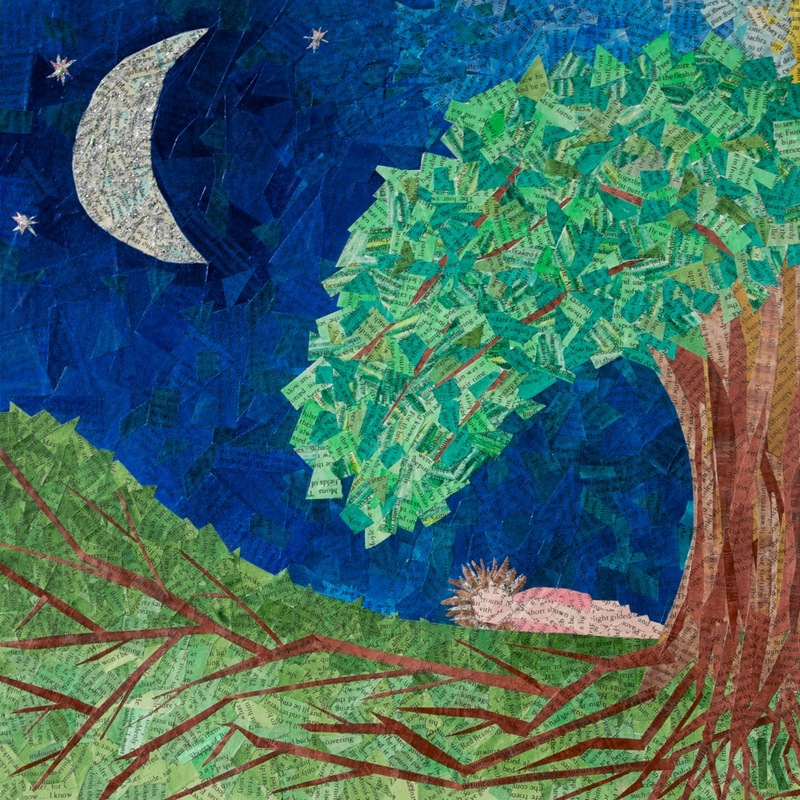 This work, titled “The Giving Tree,” is a multi-layered self-portrait, with the artist being represented simultaneously by the small vulnerable figure lying on the ground, the tree that shelters her, the roots that extend into the ground for support, and the expansiveness of the sky. Every one of us can be vulnerable, strong, grounded, open, and protective—all at the same time.